Temple Run 2 has just shattered records and become the fastest-growing mobile game of all times. The game has been downloaded an amazing 50 million times in the mere 13 days since its release. This number takes into account downloads across the Google Play Store, Amazon Appstore and Apple App Store. That record beats the one set in April 2012 by "Angry Birds Space." That game reached 50 million downloads in 35 days – a much longer time. “The game has performed beyond our wildest dreams, and we are thrilled that gamers and fans have embraced 'Temple Run 2' in such a short period of time,” said Keith Shepherd, co-founder of Imangi Studios, in a statement. I downloaded Temple Run 2 and I've been surgically-attached to my smartphone ever since. Seriously, I haven't been this addicted to an Android game since Wind-Up Knight. It's not that the game is that good (it's got great graphics, but is uber repetitive) but it's just challenging enough that conquering a new level requires some serious dedication. I have to play a bazillion times to move ahead. Oh, and there are a bunch of power-items and special features that make the journey to the finish-line oh-so-sweet. 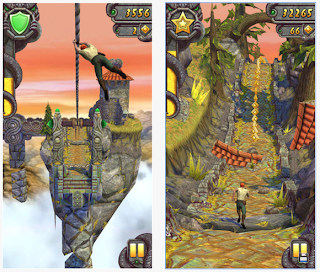 About that finish line: has anyone out there actually beat Temple Run 2? What's the ending like? I have a feeling I'll never get there, no matter how hard I try. In other news, I have a problem. I think I need to go to one of those video-game rehab centers in South Korea.